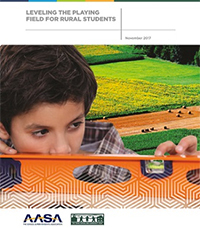 Leveling the Playing Field for Rural Students is a new report issued by the by AASA, The School Superintendents Association, and The Rural School and Community Trust that describes how Congress can take support or amend current federal policies to improve equity for the one in six children living in rural communities. Adequately Investing in Rural Schools. The report also contains a number of statistics and data points on the state of rural education and the unique educational advantages and disadvantages of attending a rural school. This report is the first of many collaborations between AASA, The School Superintendents Association, and The Rural School and Community Trust, since they announced their formal partnership in November 2017. Click here to download the complete report, or read the press release.